Wolfgang Löscher has suffered numerous personal attacks for his work on EMFs and breast cancer. But he struggled on, and now he may have resolved a fundamental problem in EMF research: Why different labs doing what appear to be identical experiments, produce conflicting results. 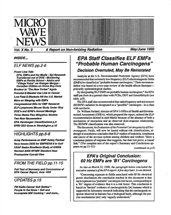 The ability of ELF magnetic fields to damage DNA may be getting clearer (see item below) —but not so for microwaves. Over the last ten years, the battle of the Washington universities has been raging, with Joseph Roti Roti of Washington University in St. Louis at odds with Henry Lai and N.P. Singh of the University of Washington, Seattle. Roti Roti is now claiming the upper hand in the February issue of Radiation Research. Environmental Health Perspectives will publish a new paper by Henry Lai and N.P. Singh showing that a 24-hour exposure to 100 mG ELF EMFs can lead to significant increases in single- and double-strand DNA breaks. The two University of Washington, Seattle, researchers found even larger increases following a 48-hour exposure, leading them to conclude that the effect is cumulative. A court in El Paso, TX, ruled on January 26 that German soldiers who developed cancer after being exposed to X-ray radiation from radar components can pursue their claims against the manufacturers of the equipment, according to the German edition of the Deutsche Welle. The defendants include GE, Raytheon and Lucent.